Well, I took 'Max' (my Mountain Trike!) on his first 'proper' maiden voyage today along the Llangollen canal path up to the Horseshoe Falls. About a 3 mile round trip along mainly flat path but with a few rise and falls and dodgy ground (and a canal to not keep out of! Haha!). It was fabulous being back there (at least 5 years, when I could walk) and Max was brilliant, I'm so in love! He got plenty of compliments and kept me, and my husband Martin, smiling. Also, what I found about using Max was I felt like I'd got "street cred". 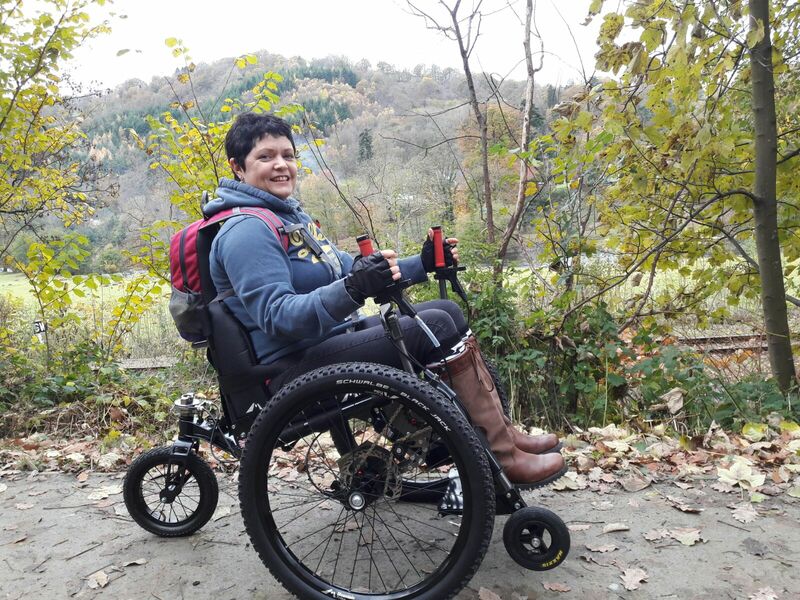 Rather than people just ignoring you or looking at you with pity or asking you why you were in a wheelchair all they were interested in was my new wheels and what an amazing piece of kit it is! People were really different. I came home and yes I was tired but buzzing from the whole experience. Using Max is great fun to drive and I didn't feel or felt like I looked disabled when I was using it. Also check out this, more recent, lovely video from Jane riding and chatting about how 'Max' continues to open up her world!